How long'll it take to say that? tl;dr: Given a string of text in some language you might want to know how long it would take to speak it. Here are some perl/python "one-liners" to estimate that. Currently supports English (US), German, French, Italian, Spanish and Japanese. The estimates are all in seconds. Brave are those who read the source code. I promise it's not intentionally obfuscated -- there's just a lot of unicoding going on, and then copious use of the right-handed saturn operator in perl. Why would you want code for this rather than a dictionary? Dictionaries are limited to their vocabulary, which is also sensitive to things like tokenization. Having a completely parametric solution seemed much more generalizable. Why would I possibly want this? We've been doing a bunch of work recently on simultaneous machine interpretation (aka "real time machine translation"). None of us is a speech person, either in the "recognition" or "synthesis" sense. This unfortunately means that to date, all of our models treat each word as "equally long" when training and, perhaps more importantly, evaluating models. For instance, if we want to measure the décalage (aka time-lag, aka ear-voice-span) between when a Japanese word is "heard" and the corresponding English translation is "spoken", we've been assuming all words take precisely 1 second to speak. This is obviously ridiculous. One quick and dirty alternative is to use a text-to-speech (aka speech synthesis) system to synthesize a sentence and use its length as an estimate of how long it would take a person to speak it. This is a totally plausible approach since decent open source synthesis software exists (we use such software to crease these one-liners), but it's slow and bloated and can't be easily distributed. This would be more accurate, but I was after a quick and filthy solution. How do these scripts work? There are two functions: one for estimating the amount of time it would take to speak a single word (sayWord in the code), and another for estimating the amount of time it would take to speak a sentence (sayit in the code). I'll first describe how sayWord works; sayit is pretty straightforward. sayWord works by extracting a bunch of features from the word to be spoken (each of these is a particular regular expression) and evaluating a linear function of the counts of the matches of those regular expressions. The process by which coefficients were generated is explained later. The features are things like: number of characters, number of vowels, number of consonant groups, number of non-letters, number of vowel-consonant switches, number of digits of various lengths, and whether the word starts or ends with a vowel; and then, for each "reasonable" unicode character for European languages, the count of those characters. Not all of these features appears for each language because I used l1 regularization to prune down the feature set. sayit attempts to pronounce a sentence by pronouncing each word individually (via sayWord) and then rescaling the resulting estimate because we ... don't ... pause ... between ... words. This rescaling is linear, and again estimated from data (explained below). How are the coefficients estimated for words? Basically I take a vocabulary of the 50k-100k most frequent words for each language, use a speech synthesis program to say them (for the European languages, I used MaryTTS; for Japanese I used Open JTalk). I then extract all the features mentioned above, create a regression problem regressing on the number of seconds it takes to speak (after removing quiet time around the word) and throwing in some l1 regularization with vw to make sure that it didn't use too many features. 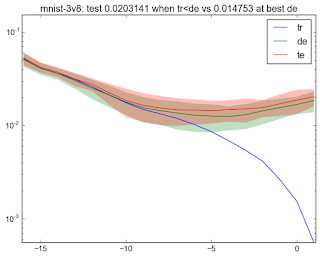 I optimized quantile loss (aka absolute value loss) rather than squared loss. One thing I did not do was weight the words by their frequency. 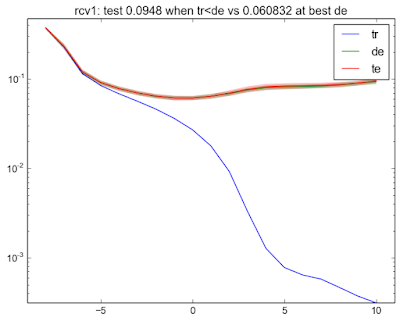 I could have done this and the resulting regression weights change a bit but not too much. At the end it spends a lot of energy making sure it estimates the speaking time of "a" and "the" and "an" correctly. Because short words are typically high frequency (and vice versa) this meant that it tended to underestimate all other words. And because my relatively frequencies were from Wikipedia, they might not match yours. Keeping a uniform distribution felt like a better solution. I also tried not regularizing and also using things like character ngram features to get a better fit. In the end I didn't include this either. You can about halve the error rate by doing these things, but I felt like having simpler, smaller models made more sense here. After all, the thing we're regressing on (speaking time from a TTS system) is sort of an artificial benchmark anyway, so getting a bit lower error is not obviously that meaningful. If you were to just predict the median on each, you would get mean absolute errors in the 550ms (Japanese) to 980ms (English) range, so this is quite an improvement. How are the coefficients estimated for sentences? The three parameters (const, a and b) were estimated by having the TTS systems speak entire sentences (about 40k from each language, taken randomly from Wikipedia) and then using the total time from the TTS (unioned across all languages) and the corresponding features. These are simply hardcoded and shared across languages. You could of course do a bit better by doing this on a language-by-language basis, but I didn't do this again for simplicity. Chances are no one except me wants this. But if you do, please feel free to use it. I'd appreciate some sort of credit though :). And if you really want the dictionaries, you can find them here: de, en-US, fr, it, ja. Thanks to Graham Neubig for providing the tokenized Japanese Wikipedia text and pointing me to Open JTalk! Many students, in response to their assigned reading for today's undergrad ML class, asked me for a formal definition of overfitting. The fact that I don't really have one irked me, especially this this basically is the problem in machine learning. This blog post is an extended version of the answer I gave in class. 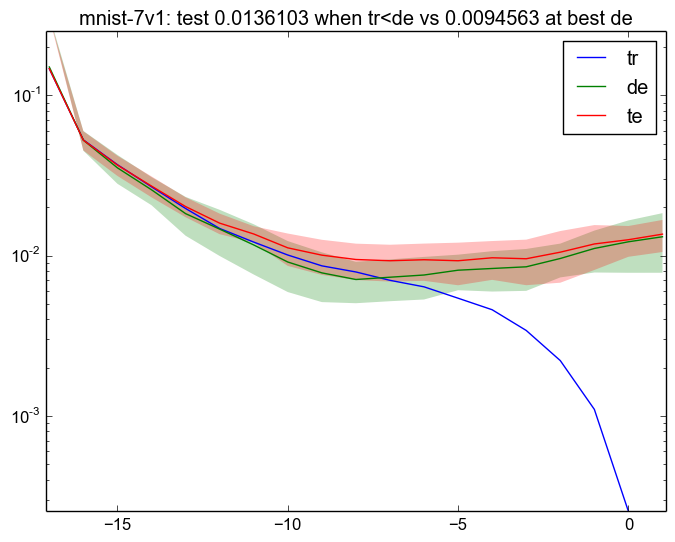 Intuitively, overfitting is when your learned model is doing much better on training data than it will do on test data from the same distribution. This happens because your model learns to fit random idiosyncrasies in the training data rather than model the true underlying trends. I then pointed to a recent high-profile paper by Cynthia Dwork and colleagues on Holdout Reuse (appeared behind a paywall in Science and something similar seems to be in NIPS too). This paper presents some really cool ideas that use machinery from differential privacy to allow one to effectively reuse the same heldout ("development") data multiple times, without worrying about overfitting the holdout. But that's not what I wanted to highlight; I wanted to highlight the formal definition Dwork et al. give for overfitting. 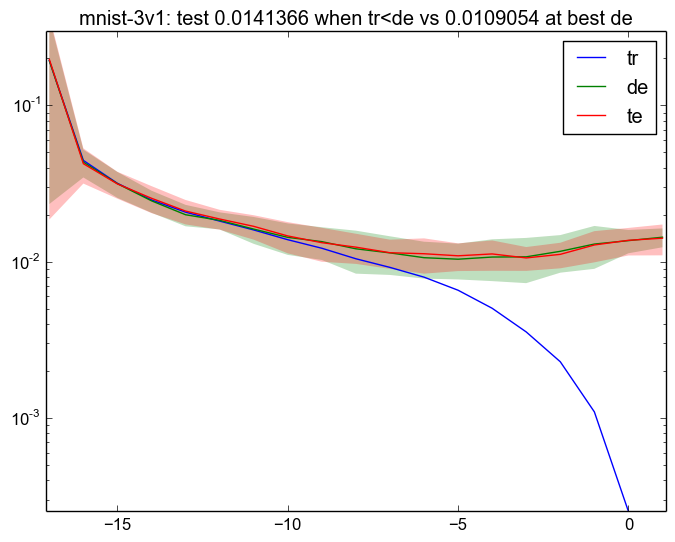 They (roughly) say that a model has overfit the training data when its test error is larger than its training error (by at least some small amount). 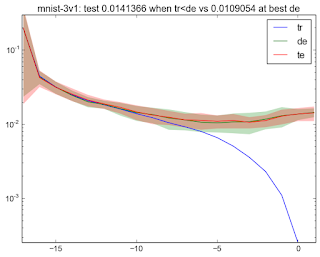 Here, the x-axis is regularization strength (this is all with libsvm, C=2^-xvalue) and the y-axis is error rate. There are error bars on dev/test but they're so small you can't really see them. The thing I want to highlight in this figure is that the best performance, measured by dev or test performance, occurs when the regularization is a bit below 0. But the point at which the gap between dev performance and training performance starts to inflate is much earlier, maybe around -4. The title of the figure tells us that the test error achieved when the training error drops below dev error is 9.48%; but when dev bottomw out the test error is 6.08%. That's leaving 33% relative error on the table. For all three splits, some easier, some harder, the relative improvement is always around 20-30% by not using the definition provided by Dwork et al. Having somewhat convinced myself that I'm not crazy, the immediate question is: what is a better definition of overfitting that captures my everyday experience? I completely agree that the definition quoted above is a necessary condition, but somehow it does not seem sufficient. Even though this was my experience, I felt a bit flummoxed because I had a hard time pointing out exactly what I felt was missing in the definition above. Here's what I ended up settling on. Overfitting typically happens, as stated above, because there are random idiosyncrasies in the training data that don't generalize. This is a finite sample effect. If I give you a dataset with 1000 training examples, and I add 100 completely random features, at least one of these features is going to correlate somewhat with the training labels. 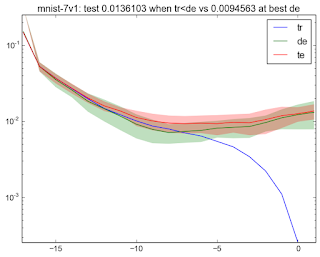 Overfitting occurs when the model chooses to use one of these completely random features, which helps drive the training error down, but hurts at test time. But there's a "throwing the baby out with the bathwater" effect going on here. Although there may be completely random features that accidentally correlate slightly with the true label, there are also weak but nevertheless useful features that correlate a small amount with the true label. On a finite sample it's going to be virtually impossible to distinguish between these two. 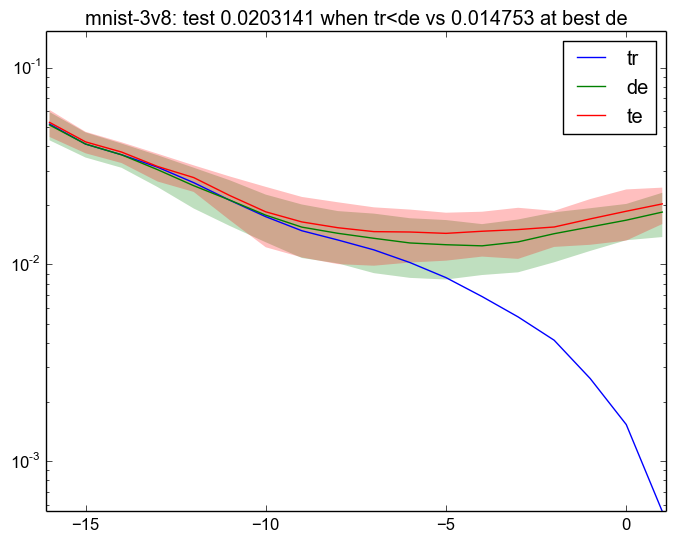 By adopting the "training error < test error" rubric for overfitting, we're forcing ourselves to throw out both types of features. This is a trade-off, and empirically at least, it appears that this is a losing trade-off. It seems better to keep around a few of these weak-but-useful features in exchange for the risk of also keeping around a few truly-useless-and-misleading features. If this weren't the case, I would have a hard time explaining my "everyday experience." So do I have a better suggestion? One really nice property of the Dwork et al. definition is that it's testable for a single model. That is, I hand you a learned function h and you can run h on some training data and some dev data and you can tell me if it's overfit. I don't have to draw curves like those above. I don't even have to know anything about how the model was built, and I don't have to sweep hyperparameters (which may or may not be sweepable). I really like all of those properties. And I believe that if we came up with an alternative definition of overfitting that obeys these properties, we can reuse much of the awesome work in the Dwork et al. paper. But I also feel like the definition above is overly conservative and it's risky to use.